Back to winning ways, United return to the midlands in hoping of getting some revenge. Ole Gunnar Solskjær had Old Trafford rocking at the weekend, following the announcement of him becoming permanent boss. Meanwhile, Nuno Espírito Santo suffered defeat, as key players were rested ahead of their FA Cup semi-final. These teams met in the quarter-final of that competition 16 days ago as Wolves claimed a 2-1 victory. Molineux is the setting once again for two sides with plenty to play for as we enter the penultimate Premier League month. That loss against 17th-placed Burnley means that Wolves have now lost more games against the bottom four this campaign than the big six, four to three. Santo’s side have been likened Robin Hood: taking from the rich and giving to the poor. With their FA Cup semi-final in mind, players such as Matt Doherty and Raúl Jiménez started on the bench at Turf Moof. A few more men may be given time off for this one but will drop to eighth if they lose by two goals. However, personnel may well not alter their strategy, as they set-up immaculately in that aforementioned triumph. Dropping their wing backs and strikers deep to deny United space between the lines or out wide, they sprung into life on the counter attack in a 3-3-4 shape and forced the Red Devils to take shots from unlikely areas in hope of giving Wolves any damaging wounds. (3-4-1-2) Patricio; Boly, Coady, Saïss; Doherty, Dendoncker, Neves, Jonny; Moutinho; Jiménez, Jota. Despite a display which was ‘below par’ according to Solskjær, United beat Watford 2-1 on Saturday to climb back into fourth place until Arsenal’s victory sent then back into fifth in the table. 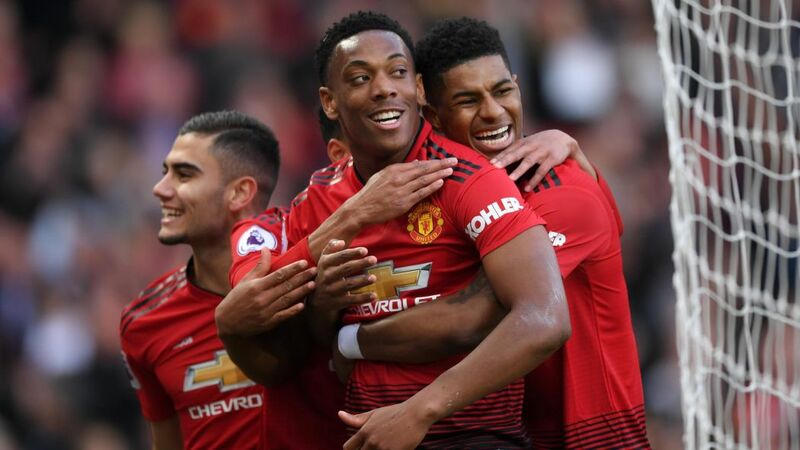 Strikes from Marcus Rashford, courtesy of some phenomenal work from Luke Shaw, and a bundled Anthony Martial effort sealed the victory; prior to Abdoulaye Doucouré scored a consolational goal in added-time. For the first time since 1995/96, four players have reached over 10 goals in the league for the Club – Romelu Lukaku, Anthony Martial, Paul Pogba and Marcus Rashford. That abject performance which allowed Wolves to reach Wembley will give the Red Devils incentive to get all three points here ahead of a free weekend. Barcelona follows that, part of a tough run of fixtures this month which includes the Catalan side twice, Chelsea and Manchester City – both at Old Trafford – along with Everton and West Ham United. In his Monday press conference, Solskjær revealed Mike Phelan’s situation will be sorted ‘very soon’ as rumours about the former player becoming the Club’s first ever technical director. Luke Shaw was awarded March player of the month on Tuesday afternoon, his third honour at the Club. That same day, the Daily Record broke an exclusive story about Ander Herrera moving to Paris Saint-Germain in the summer on a free transfer, with a rumoured £200,000 per-week wage. Following speculation that Paul Pogba could be moving to Real Madrid, the Norwegian boss told Sky Sports News that he ‘wasn’t talking about himself’ after describing the Spanish giants as a ‘dream’ destination. Recently, returning manager Zinedine Zidane commented that few midfielders ‘bring what he does’ to a team. Juan Mata – another Spaniard out of contract at the end of the season – has apparently been offered an ambassador role at the Club in a deal linked with his Common Goal organisation, according to the Manchester Evening News. Finally, the Red Devils held a MU Foundation day at Carrington on Monday, where children in care met some of their heroes face-to-face. With Victor Lindelöf absent, Phil Jones and Chris Smalling paired-up and produced solid efforts at the back, while Marcos Rojo also features under Solskjær for the first time. However, the 2018 Swedish Player of the Year is fit to return. Martial came off with a knock after scoring a goal in a quiet display for him personally, but will be fit for the match. (4-1-2-1-2) De Gea; Dalot, Smalling, Lindelöf, Shaw; Matić; Andreas, Pogba; Lingard; Rashford, Martial.